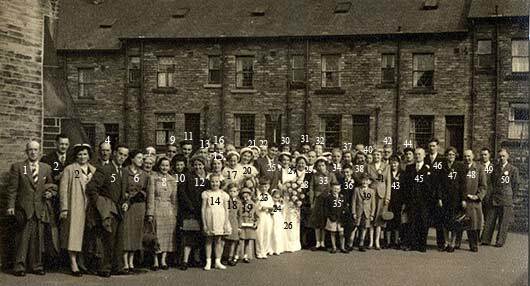 The photograph was taken outside St Walburga’s Church, Farfield Road, Shipley. 7. Lily Kendall (mother of Joan Porter and bride's auntie. Lily was a burler and mender at Salts Mill, then a housewife Lily's husband, Harold was a spinning overlooker, then a rent collector in Shipley c. 1953). 8. Joan Porter (nee Kendall. Bride's cousin. Joan was a burler and mender at Salts Mill, then a housewife). Many thanks to Geoffrey Porter for getting in touch. Information was taken over the telephone; the names alongside the number are being checked by Geoffrey. Futher information given by Pat Long, nee McNicholas. Grateful thanks to all.